Low calorie doesn’t have to mean low on flavor! 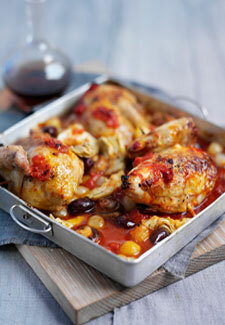 Our spicy chicken with harissa can be fired up in 18 minutes. 1. Heat oven to 200C/gas 6. Put the chicken into a medium roasting tray, then rub with the harissa, oil and oregano. 2. Cover with foil and roast for 5 mins, then remove the foil and add the cherry tomatoes and olives to the tray.